Today military spouses are 18% unemployed and 54% underemployed. Despite efforts by federal, state, and private entities to improve these statistics, we rarely discuss how being employed as a military spouse often places us out of our community’s cultural norm nor do we acknowledge the data indicating that spouse employment improves service member retention. This podcast celebrates significant others (S.O. 's) in various states of “unbecoming” with encouraging stories and strategies from job search and professional skills experts and military S.O. 's who are finding their way in the workforce. One of the most common concerns I hear from military spouses is “How will an employer see this big gap in my resume?” I’ve thought it, obsessed over it even, many times. During my time out of the workforce, today’s guest was my marathon training buddy. We ran hundreds of miles together during our shared employment gaps. We also ran our own small businesses. We ran households filled with the laughter and insanity of small children while our spouses were away. This “gap” we worried about was a time of learning, developing new skills, literally growing our endurance and resilience, and I’m so excited to bring you her story of hard work, perseverance, and finding a dream employer. I hope you enjoy this conversation with my friend, fellow Stroller Warrior, Army spouse and accountant, Sara Sealy. In Episode 12, we meet Army Spouse, Economist, and now Technologist Dr. Ruth Aisabokhae. Ruth is a native of Nigeria, a recent graduate of Microsoft’s Military Spouse Technology Academy, and today she talks about military spouse employment overseas and how her personal experiences led to struggle but also self discovery. Ruth shares some powerful advice and insights that I think military spouses, advocates, and employers can learn from. You can connect with Ruth on LinkedIn. To learn more about Microsoft Military Spouse Technology Academy, visit the Microsoft Military Affairs blog. If you’re a regular listener, you probably noticed I didn’t publish an episode last week Tuesday. I will fully admit the doctoral student, working mom and Navy wife life is definitely catching up to me. On top of that it’s time to prep for our next PCS move SO I’ll be publishing new episodes every other Tuesday until we’re in our new home in Washington DC this summer. Thank you for your patience! This week’s guest is Navy spouse and mom of one Ashley Chenot. I’m excited she’s going to share her story here because it’s perhaps a different story than we’ve heard before. Ashley hasn’t really had to move during her spouse’s still active duty career and has been able to maintain employment in her field, but even without relocation, it’s taken a bit of initiative on her part to make her career work for her and her family. I hope you enjoy my conversation with Payroll Administrator, Ashley Chenot. In this sixth episode of SO Unbecoming, we meet CEO and Executive Coach, Lakshmi Gopalkrishnan. Lakshmi is not a military spouse, but an advocate and volunteer in our community. 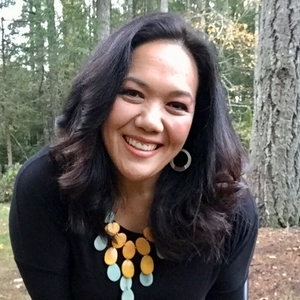 She and I met at a USO event on Joint Base Lewis-McChord and I was absolutely blown away by her energy, her insights, and her then inexplicably deep knowledge of Dr. Brene Brown’s work. She kindly let me connect with her after the workshop and after several conversations, I discovered who this magnificently talented and accomplished woman is. Over the past 23 years, Lakshmi has helped hundreds of leaders and teams at companies like Microsoft, Amazon, Facebook and Starbucks re-center and re-imprint themselves with truly transformative results. Her proven Infinite Impact 4C’s approach helps clients achieve Clarity, Capacity, Courage and Connection. Before founding her business Infinite Impact, she spent 13 top bracket years at Microsoft. She has over 5000 hours of professional coaching experience, and was invited by Dr. Brene Brown to be one of 6 Master Facilitators worldwide of "Brave Leadership", her groundbreaking courage-building program for corporations. Lakshmi holds a PhC from the University of Washington, a master’s degree from Georgetown, and is a graduate of the Strategic Marketing Management Program at Stanford Business School. Please join me for a wonderful tale of unbecoming, of rediscovering who you are, and learning how to show up in the arenas of your life bravely as your best and truest self. This is my conversation with CEO and Top Executive Coach, my friend, Lakshmi Gopalkrishnan. You can connect with Lakshmi on LinkedIn and visit her website infinite-impact.com to learn more about how to work with her as a coach! In Episode 5, I share my conversation with Aimee Olivera Sanchez. Aimee is a clinical social worker serving the veteran community and she shares an inspiring personal story of the challenges of becoming a military spouse, overcoming addiction, and ultimately creating a career and a family life that is a testament to her compassionate heart, her fierce spirit, and her incredible talents. We talk about everything from childcare, to family member support, to the new law that allows military spouses to claim their active duty partner's state of residence. I hope you enjoy it! In this episode of SO Unbecoming, we meet clinical social worker, Alexandra Brown. Alex currently works at a juvenile detention facility in the state of California providing CSEC (Commercial Sexual Exploitation of Children) services. During our conversation, we learn more about her occupation and and how she has managed her career through military PCS moves and raising 3 children of her own. We talk about licensure, child care, mentorship, overcoming personal challenges, and self care. I’m thrilled to share my conversation with fellow Navy spouse, USC MSW alumna, native New Yorker, mom, runner, and real life superhero, clinical social worker Alexandra Brown. In this second episode of SO Unbecoming, I share my conversation with Navy veteran and Military Spouse Liesel Stanhope. We talk about the challenges and possible solutions for practicing law while living the military life and discuss the related issues of child care, mentoring, licensure, and the value of portable (not work from home) careers that the modern digital workplace can provide. Let’s meet Attorney Liesel Stanhope. Happy New Year! I’m so excited to bring you the very first episode of SO Unbecoming featuring my beautiful friend, Military Spouse, and architect, Annabella Taylor. Bella talks to us about how she gained the confidence to put herself back out there after a 9 year career gap while raising 3 children and her spouse serving more than 250 days away from home in 2018. I’m very excited to share her story with you!